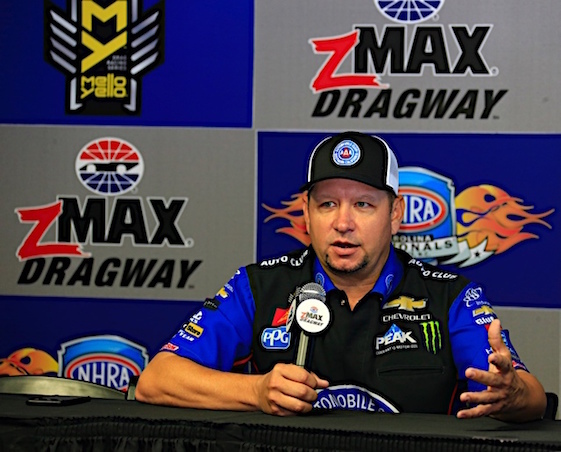 CONCORD, N.C. – Two events ago Robert Hight experienced joy and pain when he took a 30-point lead in the NHRA Funny Car standings and broke his collarbone simultaneously, but he admitted Friday it was his own ingenuity that allowed him to remain in title contention. “After surgery, I had a lot of time to lay around and think about things,” said Hight, who entered the NHRA Carolina Nationals at zMAX Dragway with a 50-point lead over J.R. Todd. Hight’s injury occurred in late September at Gateway Motorsports Park in Madison, Ill. Shortly after scoring his third victory this season and the 44th of his career there was an explosion in his car that blasted the body off of his Chevrolet Camaro SS and sent the chassis into a retaining wall. The two-time Funny Car champion was transported to a St. Louis-area hospital where he was diagnosed with a broken collarbone. “There are two schools of thought (for a broken collarbone),” Hight said. “Let it heal or have it repaired. A lot of people subscribed to let it heal. Well, that’s eight weeks minimum. After Hight returned to his California home he saw a doctor who subscribed to the “let it heal” theory. He then sought another opinion and that doctor told him his collarbone needed to be repaired. However, that doctor wasn’t optimistic about Hight returning to his driving duties at Texas in early October. He didn’t sign off on Hight competing at Texas until the 49-year-old driver showed him the piece he had made to protect his collarbone. “He wouldn’t have signed off otherwise, because basically you’re being put right back into the same thing that just bit you; the seat belts going right over your collarbone and it’s not healed,” Hight said. When using the apparatus Hight said he was comfortable in his Funny Car and he didn’t feel any pain during a run. “Now that I’ve worn this thing one weekend, I don’t know that I’ll never not wear it,” Hight said. Hight won his first Funny Car championship in 2009, but didn’t claim his second until last year. He was concerned that if he didn’t return to his car for this season’s final four events, he might never have a chance at another championship.